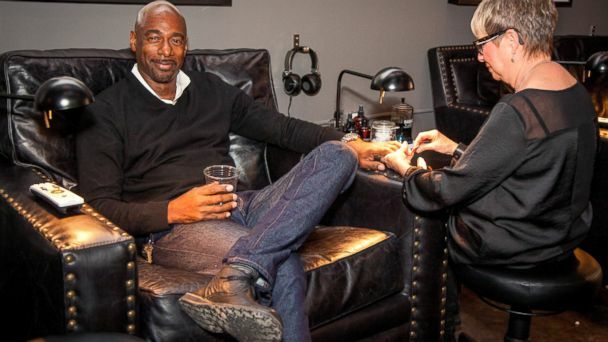 In an era of breaking down cultural stereotypes, Hammer & Nails in West Hollywood, Calif., said its mission is to help men feel comfortable getting manicures and pedicures, and that men are deserving of such pampering. But for men to feel comfortable, attention must be paid to the salon environment, says Hammer & Nails owner Michael Elliott. The salon’s amenities include large leather chairs, TVs at each station and even complimentary beer or Scotch. All serve the purpose of achieving a rugged aesthetic to please the burly men who seek a little tender care every now and then. “It’s the antithesis of what people think of when they imagine a nail salon,” Elliott says. Elliott says the idea came to him after he received a gift certificate to a local salon. He says he was disappointed because he felt out of place there, and he wanted to help men who feel uncomfortable in the traditional salon environment. Ashley Lee, the owner of Isle of Serenity salon (also located in West Hollywood), told ABC she doesn’t believe men need a custom-tailored environment to receive nail treatment. “About 50 percent of my customers are already men,” she says. Elliott, however, believes his business helps men who would not have ever considered walking into a salon, and believes he’s responding to an untapped market. “The plan is to have a Hammer & Nails in every city across the country,” he said. It remains to be seen whether men will respond to the gesture.